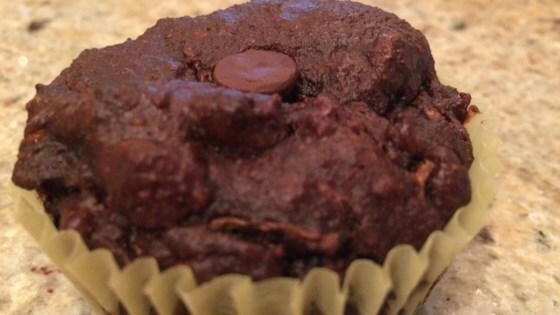 "A moist chocolaty muffin that's free of flour and refined sugar, but full of flavor and yumminess." Preheat oven to 375 degrees F (190 degrees C). Line muffin cups with aluminum foil liners. Mix almond butter, banana, cocoa powder, ground flax seeds, honey, vanilla extract, and baking soda together in a bowl until batter is well blended; fold in zucchini and semisweet chocolate chips. Scoop batter into the prepared muffin cups. Top each with bittersweet chocolate chips. Bake in the preheated oven until a toothpick inserted into the center comes out clean, about 25 minutes. Place muffins on a wire rack to cool. I have made these every week for about a year now. They’re great! Shredded carrots work if you’re short on zucchini. No changes...it was a perfect chocolate cupcake. No egg, No flour but it has a cakie consistency. Don’t know my chemistry but it’s a miracle. I was skeptical at first, but these are delicious and surprisingly good! It tastes like a guilt free brownie. Great vegan and gluten free recipe! Thank you for posting!